iOS 7 is coming to your iPhone, and other iOS devices during this fall. The newest version of iOS sports a lot of UI & feature enhancements. As we gear up for the big update, let’s talk about a feature that redefines the way music discovery services influence music lovers. iTunes radio will be available to any iOS 7 powered devices, as well as on Macs and PCs (through iTunes). 1 What is iTunes Radio? iTunes Radio is the latest addition to Apple’s line of quality products. Its integrated into the Music app as well as into Apple iTunes for Mac and PC. It is a free music discovery service that provides you customized radio stations based on artists, genres and even individual songs. You may select any station from the featured list or may create your own stations. iTunes Radio brings you large collection of high quality music streaming on your iPhone, iPad, iPod Touch and iTunes Desktop app. 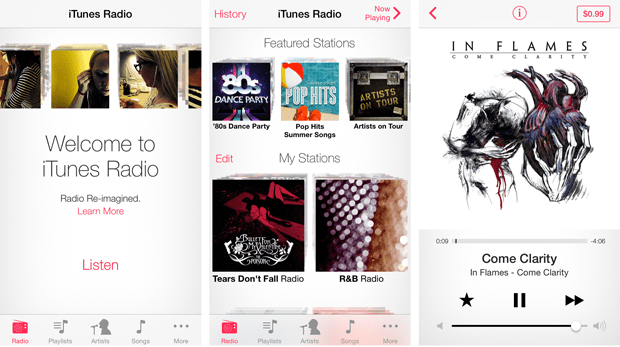 iTunes Radio has launched in the US, and slowly it will emerge in other countries. In iOS 7, this feature can be accessed from the bottom left corner of the Music app. After launching the radio app, you can add stations to your collection. Tapping on a station will take you to the playback screen, where you can listen to a large number of songs matching the station’s theme. If you live outside the US, you may need to wait for a long time to get your hands on this feature. However, if you want to access iTunes Radio from outside the US, you’ll need a US based Apple ID. Being outside the US, any device running iOS 7 will include the Music App without the Radio. But logging in with an US based Apple ID immediately brings in iTunes Radio. Follow the steps below to get your own iTunes Radio. Get an US based Apple ID by the method described in our earlier article. Once the ID is set up, go to Settings and tap on “iTunes and App Stores”. Select Apple ID and tap on Log out. After logging out of your existing Apple account, use the credentials of your US based account just created, to log in again. Now open the Music app on your iPhone, iPad or iPod Touch. The iTunes Radio option will now be available on the bottom left portion of the screen. You can now listen to hundreds of songs discover new artists, powered by the huge music catalogue of Apple iTunes. You can now get iTunes Radio right on your computer with the latest version of iTunes (11.1 or later). Just install the latest version of iTunes on your PC or Mac and you’ll be ready to roll. Create a US based Apple ID using the method above, if you don’t have one. Log in with your US based account. You may be prompted to switch to the US iTunes Store. Click on OK to redirect to US Store. Click on the Library button at the top right corner. You will now be able to see the new Radio tab in the Library Menu. Click on it and create your favorite stations. Mac users can also follow the same procedure to enable iTunes Radio. Now that you have access to iTunes Radio, you can also save music tracks while playing Radio for free. Though there is no way to download music from iTunes, we can use a suitable audio recorder to save them locally. Replay Music is one of the few software applications that can record audio at the hardware level; which means the recorded quality will nearly be the same as the original one. Replay music can also be used to record original quality songs from other music streaming services like Spotify. Before you record iTunes Radio, you need to set up Replay Music to capture songs from iTunes as they play. Download and install Replay Music. Launch the application and go to Settings >> Input tab. Set Input Source as Audio Driver. This will help you to capture audio from iTunes. Go to Output tab and select the preferred output quality. For best quality, select Record to MP3s at 320 kbps. Additionally, you can check on Identify Songs Automatically option. Replay Music can look up a recorded song for metadata including artist and album information along with Album Artwork. Open Replay Music and iTunes. Play a song on iTunes to check if Replay Music has detected the player. If it detects iTunes, the blue bar on the top right will change levels according to the beat. If not, close both the applications; launch Replay Music first and then iTunes. Click on the Start Recording button on Replay Music. On a good internet connection, if you are able to stream without interruptions, Replay Music will be able to capture complete songs and automatically split them as one song ends and another begins. 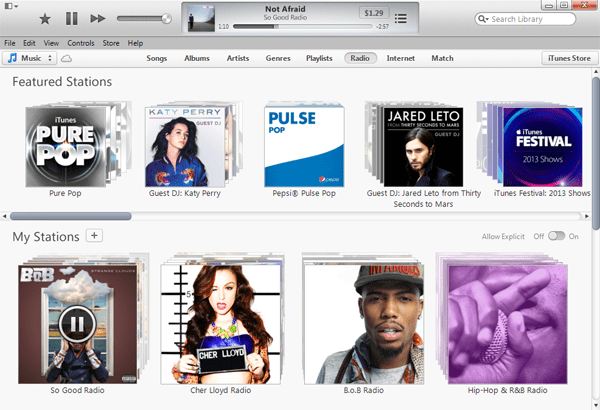 Go to Radio tab in your iTunes (Library) and begin playing a station of your choice. By default, a song which plays less than 35 seconds won’t be captured by Replay Music. But you may modify that by going to Settings >> Splitting tab. Check Automatically Split Tracks option, and change the value for Do not record or split track if less than <> seconds. Replay music will record and split songs automatically and save them as MP3 to your local folder. If connected to the internet, Replay Music will try to fetch metadata for individual songs and embed ID3 tags into them. After recording all your songs, just hit the Stop Recording button and save the recordings in one of your media library folders and the tracks will automatically be picked up by your music player.